This may be one of the coolest and best STATEMENT shirts ever! Not sure if there are any other statement tees out there that can quite live up to this one. On this shirt, you’ll see Pacman, the video game icon, eating a dollar money sign. So it’s Pacman eating Money = Manny “Pacman” Pacquiao eating up Floyd “Money” Mayweather! Now let’s just hope this shirt lives up to its statement! 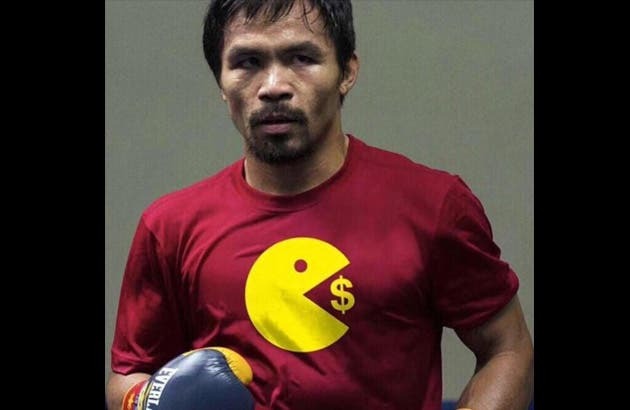 Sadly, this cool shirt was supposedly just photoshopped onto another Pacquiao image. But we’d still pay a few bucks to own one of these! Who do you think will eat the other one up in this megafight? Why? Pacquiao vs Mayweather tickets are said to cost as much as P4 million! Another boxing great, who knocked out Manny Pacquiao recently, says that Pacquiao should KO Mayweather to win. What are your thoughts? Who do you think will eat the other one up in this megafight? Why?